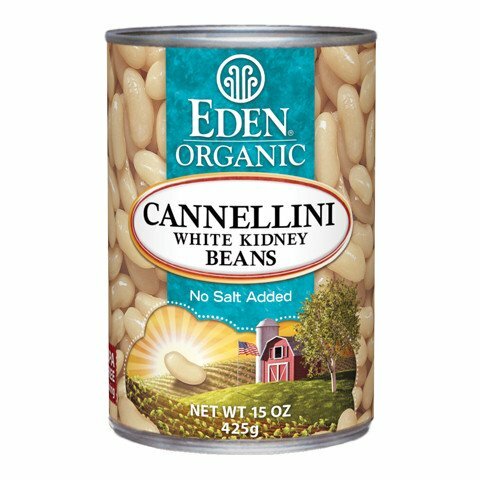 Eden Organic Cannellini (white kidney) Beans are U.S.A. family organically grown by those dedicated to cleansing the environment and producing the best tasting, most nutritious food. Decades organic vital soil gives us much more vital beans that contain more minerals and allows us to cook them without, what we consider toxic, 'processing' chemicals. Cannellini beans Phaseolus vulgaris, aka white kidney beans, are an esteemed staple in Mediterranean cuisine. Eden Organic Cannellini Beans are large, 'sea shell' white, creamy, and sweet. They are expertly prepared at our certified organic, kosher cannery in east central Indiana. Beans are washed, soaked overnight, and thoroughly cooked with a bit of kombu sea vegetable. You don't taste the kombu, but its natural glutamic acid softens and enhances the flavor of beans. All water that contacts Eden Beans for washing, soaking, and cooking is purified water. Eden Organic Beans are in custom made steel cans lined with a baked on oleoresinous c-enamel that does not contain the endocrine disrupter chemical bisphenol-A (BPA). Oleoresin is a natural mixture of an oil and a resin extracted from plants such as pine or balsam fir. These cans cost 14% more than industry standard cans that do contain BPA. The can maker, Ball Corporation, tells us that Eden is the only U.S. food maker to date to use these BPA free cans. Eden Foods was acknowledged with a "Green Packy Award" in 2010 by Whole Foods Market Green Mission's Responsible Packaging Forum. The responsible packaging award was given Eden for the use of BPA-free cans in all 39 of its organic beans, chilies, rice & beans, refried, and seasoned beans. Eden Organic Beans received high praise in the January-February 2009 Nutrition Action Healthletter, the third time Eden beans have been complimented by this respected Healthletter. Twelve varieties of Eden Organic No Salt Added Beans were acclaimed for being naturally low in sodium without the refined salt added to most commercial canned beans. Nutrition Action Healthletter noted thatsEden bean are firm, not too soft, and that all Eden bean cans are bisphenol-A free. Eden Organic Cannellini Beans are also available in 29 oz. and 108 oz. BPA free cans. They are excellent in soups, salads, and marinades. They're a Tuscan delicacy when sautéed with EDEN Extra Virgin Olive Oil and herbs, and a must in traditional Minestrone. Browse our free recipes for Crostini with White Kidney Bean Puree & Tomatoes, Cannellini Bean & Mushroom Soup, and other tasty recipes.